Here at Well Cultured, we get a lot of solicitations from companies to review or promote their products. We have never accepted an offer unless (1) we intend to review – not just promote – the product, (2) we explicitly disclose the relationship in the article and in advance, and (3) our review would be genuinely interesting to our readers. Today, we received such a scummy, trashy, and ultimately insulting “offer” that I felt that you should know about it. Media Top may want to review the FTC’s Enforcement Policy Statement on Deceptively Formatted Advertisements. Oh my gosh! Good thing I Googled Veronica Scranton and found this! 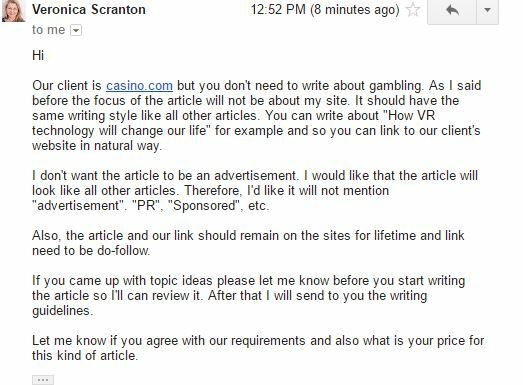 I just received an email from her (around 13 hours ago) and offered to commission an article from me as well. I replied to ask for more details but haven’t received a response yet. If I receive one within the week, I’ll see how she goes with it too. Thanks for this!!! Thanks for this, I just received an email from her as well. It seemingly came out of nowhere and was so poorly written that I immediately considered it some kind of spam. Glad to see I’m not alone in my suspicions. I just got one from Regina Soto from Media Top… same idea, just less details included. I googled the company and found this post. Glad I did- think I’ll steer clear of this little deal.